Though Comet Cleaners was not officially incorporated until 1957, our history dates all the way back to the 1920’s when founder R.L. “Jack” Godfrey opened his first dry cleaning store. Since then, Comet Cleaners has remained in the Godfrey family, with Jack Godfrey, Jr. becoming the third generation to own and operate the franchise. As a family that has made its whole living from dry cleaning and laundry services, we have been heavily involved in advancements and innovations in the industry. We have listed some of Comet Cleaner’s most impressive achievements in the timeline below. At only 12 years old, Jack Godfrey left his family to work at a tailor shop. Jack opened his first dry cleaning store. 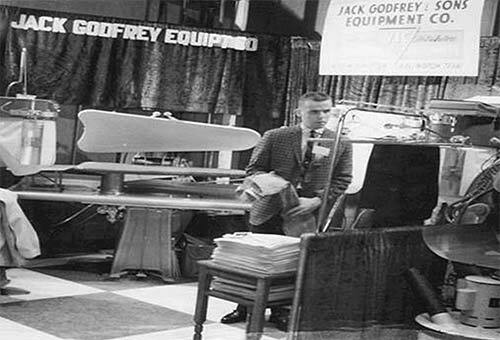 Jack married his wife, Ellen, and moved from Texas to Ohio, where he represented dry-cleaning equipment manufacturers as the Jack Godfrey Equipment Company. He and Ellen also started their family. Jack Godfrey & Sons opened the first 1-hour drycleaners. The 3-pant special was introduced in the dry cleaning business. Comet Cleaners was officially incorporated. Comet Cleaners became a specialist in the clothing retail business. The Comet Cleaner’s franchise opened an average of 20 stores every year. Comet Cleaners was instrumental in testing, marketing, and implementing a new, environmentally safe dry cleaning solvent called Exxon DF2000 that is now commonplace in the industry. Jack Godfrey, Jr. and his partner Christopher Ball purchased Comet Cleaners from his father, keeping the franchise in the family for a third generation. We now have more than 175 stores open in the US and Mexico, with more additions every year. Looking towards the future, we continue to experiment with new advancements in dry cleaning techniques and technology so that we can stay in the forefront of the industry and provide customers with better quality service. This company is our history and livelihood. We strive to maintain the high standards that turned us into a national success.